Enhance or tweak your body with this professional body contouring brush. With a perfectly crafted shape and premium synthetic bristles, you can glide bronzer or highlighter effortlessly over the curves and muscles of your body to augment your figure in a flash. This first-class brush is animal-friendly, featuring the latest in artificial hair technology to offer the softest synthetic bristles. The results offer smooth and professional contours, so you can look and feel your best. 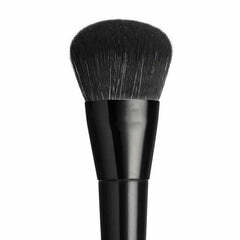 Used by industry professionals and makeup fanatics alike, this opulent brush is the real-deal for ladies who are serious about makeup. 19 cm full length. Bristles - 4cm high, and 3cm wide.